Sometimes people are willingly dishonest rather than risking embarrassment. Such is the case in this whimsical rendition of Hans Christian Andersen’s classic tale. 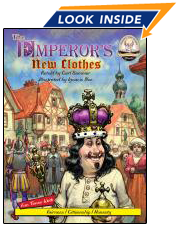 Excessive fondness for elaborate and expensive clothing allows a pair of dodgy tailors to hoodwink the emperor. Weaving a grandiose tale instead of actual clothing, the tailors tell the emperor that their exquisite garments, woven with the finest of materials, are invisible to less worthy individuals. Reluctant to admit possible imperfections, no one in the town is willing to be honest, with the exception of one small boy. The conclusion of this tale extends beyond that of the original, shedding light on the benefits that come from always telling the truth.